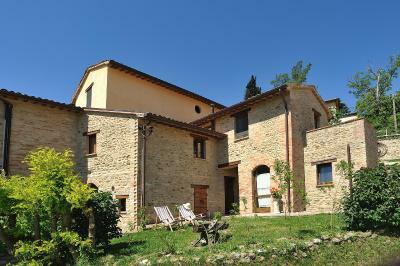 Lock in a great price for Country House Ca' Vernaccia – rated 8.6 by recent guests! A very quiet, comfortable place in a beautiful setting. The restaurant is very good for dinner. The beds and pillows too firm. The breakfast very basic. The agriturismo is close to Urbino's city centre, with a nice view from the room. The owner searches himself the truffles that are served in the restaurant: it ensures a good quality of the truffles. Quiet location, beautiful view, great restaurant!!! The food was delicious, among the best we’ve had in Italy. If you like truffles you will love it. There were lots of locals eating at the restaurant. It is well worth the drive from Urbino. The staff were very friendly and helpful. This place was a gem. The best kind of "rustic" accommodation. The old buildings, old wood framed doors, stone steps etc satisfied my need for "character." And the bed and bathroom facilities were new and spotless. Perfect combination. We opened our window to a view of the hills in the distance and had wine before dinner on our own terrace. The on-site restaurant was a find too. Friendly service with wonderful food. Try the truffle risotto! Wish we could have stayed longer. The location was so quiet and the restored stone buildings were charming. The restaurant food was very good, so there was no need to go out again after a day sightseeing. The view and the surroundings and especially the dining area The staff were particularly friendly and helpful. Staff was wonderful and dinners were amazing; real Italian dishes all home made from scratch! The rooms were big and comfy. We stayed in a 2 bedroom apartment and both bedrooms had one large bed and one single bed, and they even put a cot for our baby in one of the bedrooms with blanket, pillow, etc. There was also kitchen in the living area, and one bathroom with shower. The staffs were friendly and the view was also very nice. We stayed only one night but we loved it. We returned to this property because we had enjoyed it so much the first time. 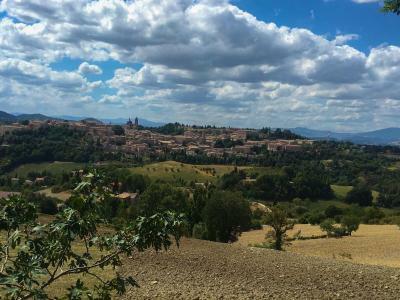 The major attractions for us were the pleasant attentive staff, the truffle risotto - absolutely delicious - and the stunning views from the property. One of our best sellers in Urbino! 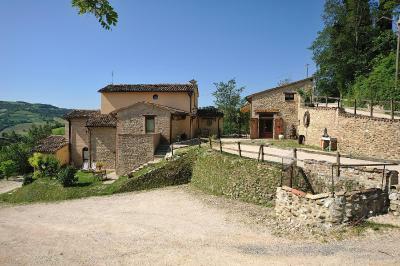 Ca' Vernaccia is an 18th-century country house made of local stone and brick. 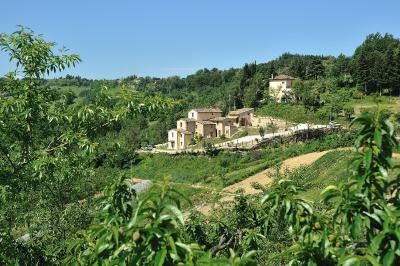 Only 5 minutes' drive from Urbino, it has a quiet location and traditional restaurant serving local specialties. 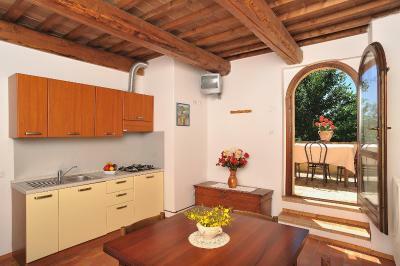 Country House Ca' Vernaccia offers a choice of rooms and apartment. Both have rustic décor with wood-beamed ceilings and views of the garden. The apartments also include a kitchenette. Croissants, cakes and jams are served at breakfast each morning. Savory items are prepared upon request, at extra cost. Italian cuisine and dishes from the Marche region, including truffle specialties, are available at dinner. Free parking is provided and free Wi-Fi is available in public areas and in some rooms. 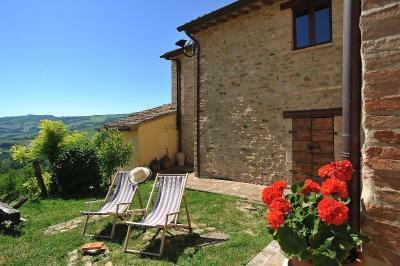 When would you like to stay at Country House Ca' Vernaccia? This room has rustic décor and wood-beamed ceilings. It also features a TV, private bathroom and view of the garden. Some of the double rooms overlook the mountains. This apartment has rustic décor and wood-beamed ceilings. It features 1 triple bedroom and a separate living room with kitchenette. It also includes a TV, private bathroom with disabled access and view of the garden. This apartment has rustic décor and wood-beamed ceilings. It features 1 quadruple bedroom and a separate living room with kitchenette. It also includes a TV, private bathroom and view of the garden. This apartment has rustic décor and wood-beamed ceilings. It features 2 triple bedrooms and a separate living room with kitchenette. Facing the garden, this apartment has rustic décor and wood-beamed ceilings. Offers a double room, separate living room with kitchenette and sofa. Includes a TV and fully equipped bathroom. Facing the garden, this rustic-style room with wood-beamed ceilings. Offers a separate living room with sofa, a TV and fully equipped bathroom with shower. Extra beds are 2 bunk beds. This apartment has rustic décor and wood-beamed ceilings. It features 2 double bedrooms and a separate living room with kitchenette. It also includes a TV, private bathroom and views of the garden. This double room has a private entrance, soundproofing and tile/marble floor. House Rules Country House Ca' Vernaccia takes special requests – add in the next step! 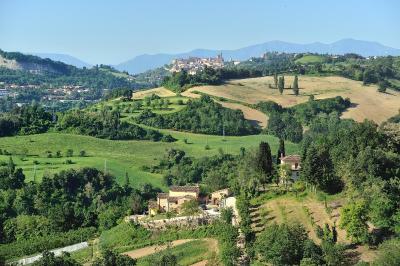 ATM card Country House Ca&#39; Vernaccia accepts these cards and reserves the right to temporarily hold an amount prior to arrival. 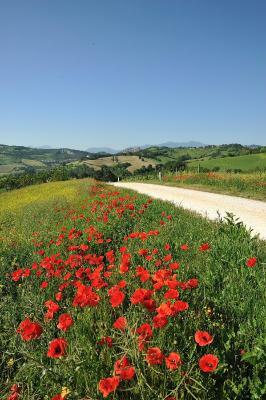 Country House Ca' Vernaccia accepts these cards and reserves the right to temporarily hold an amount prior to arrival. Please note, only small pets are allowed in the premises. It was a very bad experience..The bed is not comfy the room is not nice. No free drinking water in the room. No kettle to make hot drink in the room. The dinner in their restaurant was very bad. Low quality. They served us old bread not fresh. The soup tasted like the one you buy from supermarket. Risotto was a disaster. We went to eat tartufo as it's mentioned they are specialised in it but we ended eating some tartufo shavings on top of the pasta. There is no stuff only one man that it is difficult to communicate with and he is not a welcoming man. The breakfast is very cheap and also low quality food. The tv in the room is very small, we found some hairs in the bathroom. The only potential downside is the distance from town if you don’t have a car - this was actually a plus for us as we were driving and prefer somewhere out of town. The road down to the property is steep and winding. Careful driving required. Breakfast was disappointing. Beautiful country house, warm and friendly staff. The bedroom was very dark, but it was comfortable, and were weren't in there for long! Loved the country setting and the family who run the country house, great service and a very warm welcome. Everything was nice but if we say one thing, the air conditioning in the living room was a bit noisy. The road down to the accommodation is a bit of a challenge to an Australian driver used to wide roads but very much worth the effort. Wonderful place. I also want to mention a restaurant that I strongly recommend. Umberto thank you very much for hospitality.